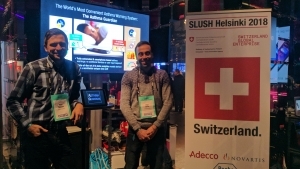 Peter and Filipe, our “digital biomarkers for asthma” team, attended this year’s SLUSH in Helsinki on Dec 4 – Dec 5. Despite the cold and dark weather, SLUSH is considered the world’s leading startup event with more than 20’000 attendees. This year, over 3’100 startups, 1’800 investors, and 650 journalists from 130 countries gathered to discuss trends in technology, the latest research, and business opportunities.